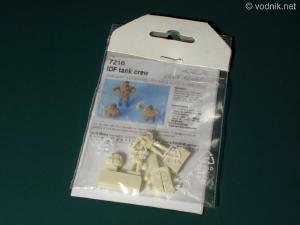 Israeli Defence Force tank crew set in 1/72 scale made by Goffy Model contains three resin figures. They are packed in a small zip-bag with a thick paper backing with a printed label on it, showing assembled and painted figures. All three figures are molded with separate heads and we also get three separate hands. Only one full figure is in the set. This figure is looking up, so can be either put next to the tank talking to the crew on the turret or in the turret hatch looking to the sky. Right hand is a separate part. The second figure is a 3/4 one, meant to be put in the open turret hatch and both its hands are separately molded. Third figure, the driver, is molded from waist up and his arms end at elbows. I don't know much about IDF uniforms, but hooded coats on Goffy figures suggest operation in colder environment - in mountains or during the winter. Click on picture to enlarge it. Close-up shot of heads and one figure. 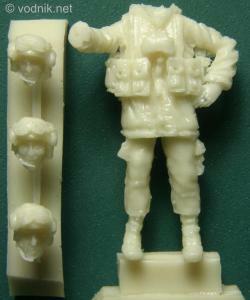 Figures are well sculpted molded, considering their small size. Details are very crisp. I have not noticed any air bubbles and there is just minimal flash on parts. Resin puring blocks seem to be easy to get rid of. No painting instructions provided so modeler must use their own references for correct IDF uniforms and gear colors. 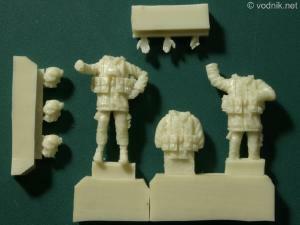 IDF tank crew figures are another well sculpted and molded set from Goffy Model. I can recommend them to all modelers building 1/72 Merkavas or other Israeli vehicles. Just remember about warm clothing on these little guys, as it may not be suitable for many Middle Eastern dioramas.